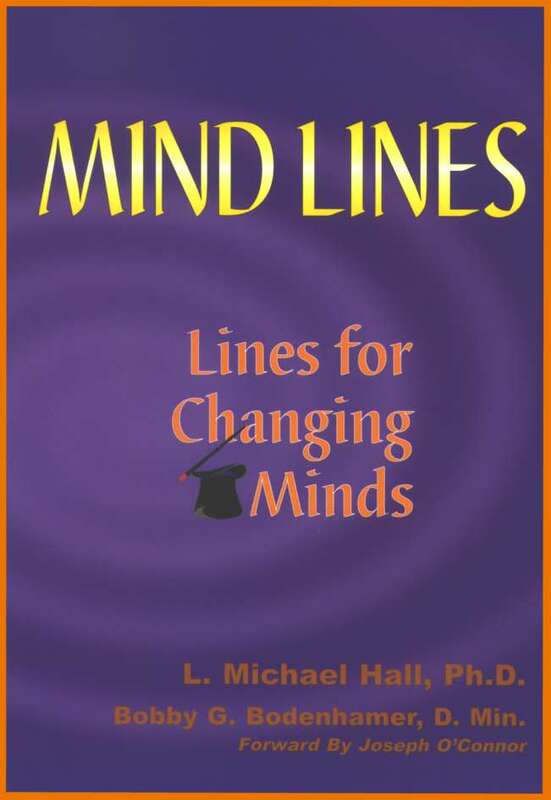 Mind-Lines: Lines For Changing Minds – Brand New Fifth Edition (1997, 1998, 2000, 2001, 2005) offers the magic of conversational reframing. Hall and Bodenhamer have taken the 17 traditional “Sleight of Mouth” patterns in NLP and totally repackaged them using a logical level system that provides an order and structure that you will find easy to learn and remember. In Mind-Lines you will learn to think about directionalizing consciousness (whether yours or someone else’s!) in one of seven directions. With these seven framing structures you will then learn 26 Mind-Line patterns for effectively transforming meaning. In a most playful and delightful way, this volume picks up on the original metaphor that initiated the field of NLP–magic, the magic of language that so powerfully effects human affairs, human experiences, and human “reality.” Then, as magicians, Hall and Bodenhamer reveal the magic box, that invisible magical box that every neuro-semantic creature has access to. They then show how to use the meta-model distinctions to either de-mystify experience and “reality” (neuro-linguistic reality) or create much more useful and empowering magic. This first published work on the “Sleight of Mouth” patterns rigorously reworks the model and present it in a most readable format. Section I offers three explanatory and preparatory chapters on Language as Magic. Section II offers five chapters on the Directions For Reframing. The last chapter offers a more theoretical understanding of the meta-model, how language works, and its quasi-magical nature. A must for anyone who wants cutting-edge NLP material! Attention All Conversational Magicians! To tease you about Mind-Lines we have here put our Second Chapter— please feel free to download and use. Because our re-packaging of the model offers a new rigorous look at Reframing — provides a model of 7 Directions for Reframing, and 26 Mind-line Patterns… we don’t want to put that OnLine… but you can buy the book –we have the second draft of the manuscript completed with the complete model. In fact, buying at this early stage in the game –and working with the model –if you come up with suggestions, improvements, etc., we may just put such in the book, with credit to you. (Hey, was that a mind-line?) As a conversational model for languaging — and all the ways that we can learn to swish and directionalize the brains of our auditors using the 26 swishes in Mind-Lines, this work stands as a model of persuasion and will obviously have lots and lots of applications in every field that depends upon influential communication patterns. If you thought linguistics had all the relevance and fascination of declining Latin irregular verbs on a wet Monday afternoon, then prepare for a pleasant shock. Fun to read, and valuable to use, this book invites you to play with language. Language makes the bond between us, how we relate to each other and even if we do relate at all. How do we connect and understand anything? Through language. We all learn it, and how well do we use it? My English Language school studies were confined to interpreting a Shakespeare play and being able to tell an intransitive verb from a transitive one. Heaven forbid that it should tell me how to use language with purpose, to play with it, to light linguistic fireworks that would burst with multiple meanings and dazzling eloquence in my listener’s mind. Language lies deep level in our minds, we cannot not respond to it. Sticks and stones can break our bones but words can break our hearts. And they can also heal and inspire our spirits. As you read this book, some of the power of language will become yours to command. Language both describes and prescribes, you have to accept certain ideas to understand what you hear. And as it directs your attention towards some things, it just as surely makes others invisible. You create whole new worlds every time you read a novel, and you will create meaning as you read this book. Words mean nothing without a listener, so as you come to understand how we make meaning from these intriguing black squiggles on the paper, and the sounds in our heads that are one way we represent language, you will have more freedom and choice about how you use it. ‘The man looked at the woman and said “cheese”.’ What does that mean? It depends on the context that surrounds it. Could this be a kitchen scene? Is he being insulting? Telling the punch line of a joke? Or is she taking his picture? Or perhaps it is an example of an ambiguous sentence with multiple meanings that I concocted to make a point? The words have no meaning without a frame to put them in. Isolated from a meaningful context, all you will shrug your shoulders and move on. So what? So, if you want to be understood you need to set a frame that tells the other person how to understand what you are saying in the way you want it understood. And, when responding, it gives you ways to change and play with the frames, or lack of them, in what you hear to influence the conversation. But, also, ‘What could this mean? All credit to the authors for making this clear, showing the structure behind it, and how to use it in practice. We have found a magical formula box wherein lies all kinds of wonderful and horrible things. Like a magician with his or her magical box from which to pull and put all kinds of wild and crazy things–the magical formula box to which we refer lives inside human minds. The brain produces it, and yet the magic box transcends the brain. In this book you will discover how to identify your magical formula box from which, and by which, you construct your heavens and your hells. You will learn about how everyday you pull things out of your box to your weal or to your woe. What semantic magic did you pull out of it today? What magic will you learn to pull out of it tomorrow? You will discover how you also can put new and more enhancing formulas for new kinds of magic into your box to make your life much more filled with love, joy, faith, hope, and resourcefulness. Alright! And because everybody you meet also has a magical formula box–you will learn some very, very powerful magic. You will learn magic that will enable you to change realities, to alter the direction of life, to change the past, to restructure emotions, to shift paradigms, to leap logical levels at a single bound, and to jump off tall towers of terror in a single leap, to utter mind-lines and see demons vanish and heavens spring into existence, and much more. Interested? Then come with me to explore your own neuro-linguistics and neuro-semantics. Become a magician so that you can use your meaning-making powers with grace and power. Mine those mind-lines that will change your mind for good– change it so that you can run your own brain, make the changes you want, and keep the change forever. Learn to become truly elegant and professional in the mind-lines you offer to your associates, loved ones, and friends. We have humorized and popularized a domain in neuro-linguistics that otherwise might seem academic, hard, and deep. The language game in linguistics and general-semantics doesn’t have to be played in a boring way. So come play with me. And bring along your magic formula box. Now let the wonder of magic begin! A long, long time ago (1980 to be exact), so the story goes, at a training in Washington, D.C. on NLP, Richard Bandler conducted a workshop wherein Robert Dilts recognized some truly new patterns in Richard’s interactions with a participant and the group. It occurred around the theme of “going over threshold” and experiencing “the last straw” in a relationship. Richard wanted to explore the possibility to reversing the foreground/ background shift. Could a person’s perceptive of only seeing all the things bad and wrong and ugly in another person be suddenly reversed so that as all of that fades into the background, the good, right, and beautiful zooms into the foreground of awareness? At this point in the training, Richard was working with a young man who was breaking up with a girlfriend who thought he would be willing to reverse things, but who ended up being “quiet creative at thwarting every option, possibility, or reason that Bandler brought up as to why he might reconsider his opinions about his girlfriend and their relationship.” (Dilts,1999, p. 272). This was the context. Though the young man wanted to be cooperative, he found himself in a very stubborn state of mind. In response, Richard with his “flare for the outrageous” used the situation of the broken stage as a metaphor and played a frame game with the young man and the audience. Robert Dilts tells the full story and presents a transcript in Sleight of Mouth (1999, pp. 270-296). Richard adopted the attitude that another participant had intentionally sabotaged the stage in order to hurt and embarrass him and that he would not give him another chance. Then he acted out the young man’s dilemma by sitting down and challenging the group to fix it. He has much said, “I have a problem. You fix it.” This essentially put the young man in a meta-position to observe his own patterns and at the same time used Metaphor to dramatize his thinking. Then as Richard played out the client’s role, he invited the NLP practitioners to try to alleviate his problem and fix him. They could not. Even though they knew the magic of NLP, nothing they did seemed to touch the resistively stubborn belief system. Somehow, using some special language patterns (mind-lines), Richard deflected any and all attempts that otherwise would have enabled him to experience a positive transformation. (Perhaps he had modeled how people generally defeat positive endeavors.) From this experience Robert Dilts speaks about his “Ah ha!” experience of recognizing certainly linguistic patterns that he had been studying. So he and Todd Epstein formulated fourteen patterns and these then became known as the NLP “Sleight-of-Mouth” Patterns. The “Sleight of Mouth” patterns utilize patterns and frames-of-references which we can use to persuade ourselves and others. We can use them empower ourselves to make enhancing transformations that bring out our best. We can just as equally use them to limit ourselves by deflecting any and every transformational idea that comes along. We all use these patterns (or at least some of them) to maintain our beliefs anyway. In this, neither Bandler nor Dilts invented these patterns. We find them operative in people throughout history and in all cultures. Bander, Dilts, and Epstein only made them explicit so that we can work with them with more precision and understanding. Robert Dilts, in fact, speaks about his own study of the linguistic patterns in Jesus of Nazareth, Karl Marx, Abraham Lincoln, Albert Einstein, Mohandes Gandhi, Martin Luther King and others. In this masters, he discovered that they used common patterns to influence the minds and beliefs of those around them. In the 1980 training, Richard artfully used these language patterns, to show their power in deflecting and breaking up valued and helpful ideas. He also used them to show how we can use them to put ourselves into conceptual boxes to prevent growth, change, transformation. We can use them to detect such and to open up new space for generative change. Learning these patterns puts us more in control in handling our conceptual world (i.e., our own neuro-semantics and that of others). Using “Sleight of Mouth” patterns enabled the co-founder of NLP to resist highly trained professionals and defeat their best efforts. This illustrates one way these powerful language skills operate as they mold our beliefs, and hence our realities. In this work we have made these patterns even more explicit as a facet of training and skill development in neuro-linguistics. Such training results in developing greater competency in our use of language. With Mind-Lines, you will be able to break up unwanted belief patterns that hinder you. You will be able to shift the paradigms of your conceptual reality in one fell swoop. The original formatting of the “Sleight of Mouth” patterns came from Robert Dilts and Todd Epstein. As they codified the language patterns they picked up from Richard Bandler, they specified 14 “Sleight of Mouth” patterns. These formats enable us to eloquently reframe almost anything and so they represent the first NLP model of persuasion. In the first edition of Mind-Lines (1997), this work became the first book on the “Sleight of Mouth” Patterns. Mind-Lines reworks the persuasion patterns and provides a new structure to the mental and verbal moves. We made the model more rigorous, methodical, and streamlined as we examined the theoretical foundations of the model. We also used the meta-levels structure inherent in Meta-States, the levels of “thought” or mind which governs Meta-States. This begins to recognizing the levels of meaning. On the primary level, “meaning” arises from associations and linkages. Reflectively, every higher level of “meaning” involves the setting of frames or mental contexts. Given that, we can then send the brain in seven directions. This gives us seven reframing directions. And within this directions, we have 20 conversational patterns (actually 26 with this third edition). In a sleight of hand move, a magician distracts those watching. He or she will do one thing that captures the attention of the audience while simultaneously doing something else. A similar thing happens with the “Sleight of Mouth” patterns. It involves a distraction of an auditor by leading his or her consciousness in one direction, while making a conceptual move of some sort in another direction. This results in the generation of an entirely new perception. Then, all of a sudden, a new idea or belief (a frame-of-reference) comes into view, and the auditor doesn’t really know where it came from, or how. When a card illusionist does sleight of hand movements, he or she performs one set of actions that so captivates the interest of his viewers, that they really don’t see what else he does that actually changes things. Consider what happens to the attention of those watching. It gets shifted, and captivated, so that it preoccupies itself at a place where they think and anticipate the action will occur. Then, on another place, the more significant action occurs. When this happens, sleight of hand creates for the viewer an illusion, and this illusion frequently results in a shock to consciousness. “How did he do that?” “Hey, I saw her move it over there, so this can’t be!” This process itself then becomes codified in a distorted statement which encourages the illusion even more because the operator will say, “Well, the hand is quicker than the eye.” But not really. The solution does not lie in “seeing faster,” it actually lies in not getting distracted. No matter how fast or skilled a person’s seeing, if the person sends his or her “mind” off to pay attention to irrelevant factors, the illusionist will get them every time. A similar process occurs with verbal behavior when we deliver a really good mind-line. This happens all the time in human interactions and communications anyway. Sometimes it occurs in interactions that we engage in just for fun and enjoyment. Sometimes it occurs when we interact and negotiate with someone to create win/win situations. Then again, sometimes it occurs when someone intentionally seeks to pull the wool over someone else’s eyes in order to take advantage of them. What corresponds linguistically, or conceptually, in mind-lines that distracts a person’s mind? Content. Yes. Just invite another human being into a discussion about content and you can do all kinds of things (and I’m not kidding about this) in altering, changing, and transforming the context. And when you do, most people will never notice. There you go! We knew you would bring that up. And, yes any talk about doing things to people’s brains (especially shifting their consciousness) inevitably brings up the question of ethics. So we applaud this. Yet the problem doesn’t actually pose that much of a problem. Not really. After all, given the nature of communication and relationship, we cannot not communicate, we cannot not influence, we cannot not manipulate. After all, to “manipulate” only refers to “handling” ourselves, our messages, our intentions, etc. Of course, in negative manipulation we “handle” ourselves in relation to others in a Win/Lose way wherein we seek to benefit at another’s cost. Conversely, in positive manipulation we relate to others from a Win/Win attitude so that everybody benefits. Further, while manipulating someone to that person’s disadvantage may “work” momentarily, it will not work over the long-term. The NLP model actually assumes this ethical position. As it operates from a systemic and long-term perspective, it begins with the presupposition that when people feel resourceful, empowered, and at their best, they will bring out their best, not their worst. This underscores the importance of the Win/Win perspective in personal relationships and communicating, does it not? It also eliminates any need to engage in negative manipulations with people. Since NLP grew out of a systemic paradigm that encourages systemic thinking, it therefore disavows any behavior that creates long-term pain for others. The language patterns of persuasion that have gone under the label, “Sleight of Mouth” patterns, originally arose from the Meta-Model (Bandler and Grinder, 1975). This very powerful model explains how language works neuro-linguistically (rather than linguistically), and how we can work with language effectively. When we translate the Meta-Model into a conversational model for reframing (for transforming meaning), as we have here, we obviously incorporate a lot of powerful verbalizations which an unethical person could misuse. And yet the best defense against such lies in knowing the same model. Then you can catch mind-lines that would otherwise “play with your mind” at unawares. What do we use mind-lines for? We use mind-lines primarily in order to work with, transform, and enhance “beliefs.” Beliefs, as such, can involve a wide range of conceptual ideas. Frequently they relate to our semantic “shoulds” that we put upon ourselves as moral imperatives. They relate to our assumptions about causation what causes or leads to what, and to our assumptions of meaning what equals (“is”) what, what associates with what. These semantic constructions describe mental filters which we rarely question. Via these linguistic patterns, we can loosen a belief or semantic structure. We can question whether we really want a particular belief as a part of our mental map. Why do we have beliefs in the first place? We develop them in order to “make sense” of the world. They help us to reduce its size and complexity. Beliefs enable us to delete a great deal of the chaotic over-load of the world by shifting our attention to an organizing frame-of-reference. Given the complexity of the world, Aldous Huxley (1954) said that our brains function as “reducing valves.” So with all of the information that constantly bombards our brain/nervous system, to make sense of things, our brain deletes to only let in so much. Then it generalizes into belief formats. This obviously distorts things (and does so in both useful and unuseful ways). Suppose every time we saw an automobile, we had to learn afresh its meaning and purpose? We would always be learning and we would never develop stability in our learnings so that we could use our previous conclusions as our assumptive reality or programs. Happily for us, our brains generalize an idea of “an automobile” by deleting unimportant distinctions (color, model, year, make, etc.). Using the classification of “car” gives us such a program. It frees us from having to think afresh about what a “car” is, how it works, what to do with it, etc. When we get into a car, our internal mental map (belief) activates and off we go, unthinkingly driving down the road (and boy do some people drive unthinkingly!). Beliefs not only set frames by establishing classifications, beliefs also tell us how to feel and respond. To hold a belief like, “All politicians are evil!” not only classifies politicians, it also programs us about how to feel about any specific member of that class. A generalization like this induces several negative neuro-semantic states (aversion, distrust, dislike, etc.) and controls our perceiving, thinking, and feeling. Beliefs exist as concepts or mental constructions. They arise as learned and invented ideas conceptual understandings about ourselves, others, the world, etc. So while they may lead to various external realities (actions, talk, behaviors, etc. ), they do not have that kind of reality in and of themselves. In themselves, they only exist as ideas in the mind. They emerge in consciousness as learned, created, and installed frames-of-references confirmed thoughts. Because these constructions exist as ideas, then other ideas can affect them, and do so powerfully. This describes the interface point between beliefs (as a kind of idea) and mind-lines (as another form of ideas). For this reason, beliefs, as lines that construct meaning in the mind, respond to mind-lines. So using one or more mind-line enables us to shift our limiting paradigms. Mind-lines can liberate us from our meaning boxes; mind-lines can alter internal realities. Because these patterns of reframing work directly on beliefs, we can use them in a wide range of contexts: personal and interpersonal, business, negotiating, arguments, persuasion, sales, advertising, effective public speaking, writing, etc. We here have sort out 20 Mind-Line patterns that you can use to handle objections, persuade someone of your point of view, motivate yourself, do therapeutic change, invite others to consider your viewpoint or proposal, incorporate in your presentations to increase your influence, etc. The reframing patterns that make up the mind-lines especially play a significant and powerful role in therapy. I understand that Connirae Andreas developed her skills in using the “Sleight of Mouth” patterns by spending an entire year just using these shifts with all of her clients. In this way she became highly skilled with these patterns. When Christopher Tomossen read the first edition of this book, he began writing twenty mind-lines every day to familiarize himself with the patterns and to develop elegance in conversational reframing. As a result he found himself able to quickly use the magic of mind-lines with clients and customers. No, these patterns are not “therapy” in any traditional sense of what we typically mean by psychotherapy. In fact, when we respond to someone with mind-lines, we do the very opposite of Freudian and Rogerian therapies. Not only do we not focus on the past, we do not assume people are broken, need to understand “why” they “are” they way they are, and need to fully experience their emotions to finished the old business. Yet, on the other hand, because mind-lines open up mental and emotional space where personal transformations can occur, they do have a “therapeutic” effect. A person can use them to feed the mind with ideas that increase personal resourcefulness, tap into the wisdom of the mind-body system, and provide profoundly new ways to think about things. As psychotherapists, we have used mind-lines to loosen up (deframe) beliefs, reframe ideas, set new frames that open up a solution- orientation to problem solving, and outframe with transformative ideas that generate all kinds of profound changes. Conversational Reframing: Overt or Covert? Typically, in therapeutic reframing we make a person’s frame-of-reference conscious and explicitly overt. We do that in order for the person to alter the frame with choice and awareness. Of course, this takes time. It also takes effort. Conversational reframing avoids the time and effort involved in this conscious work of reorganizing the contents of consciousness. We just get “down and dirty” and do it! None of the overt stuff. No stopping in the middle of a business conversation or negotiation to therapeutically explore a person’s beliefs systems, or where he or she learned it. With Mind-Lines, we work covertly. We just deliver them in our everyday talk. We speak the conversational reframe, redirect consciousness, speak the line, and then watch someone suddenly develop a more resourceful frame of reference. Typically these conversational reframes occur during those times when we find ourselves communicating with a client, customer, or friend (or even ourselves) and need an easy and quick way to redirect a brain to a new point of view. In such a moment, we don’t have the time (or even permission) to go through all the trouble of conscious meta-modeling. So we just reframe the person with one or more Mind-Lines. If the person buys the reframe, then presto they suddenly have a new perspective. By doing this, we provide new enhancing meaning to something that otherwise produced an unproductive state. When we offer a different viewpoint, we frame a piece of behavior, understanding, situation, etc. and that transforms its meaning. The following lines for the mind redirect brains to expand perspective. This expands the person’s model of the world so that the way one then experiences the world becomes broader, more expansive, and more empowered. Communicationally, this offers a profoundly positive gift. People will fight you tooth and nail if they feel attacked. Induce someone into a state where they feel attacked, inadequate, or vulnerable, and we can count on their defense mechanisms going up. Does that sound familiar? And when people “go defensive,” count on that further complicating communicational clarity. In light of this, Mind-Lines enable us to do several things. With some of them we track a person back to the experience, or experiences, out of which the belief learnings arose. When the person gets there, he or she then has an opportunity to remap to create a new and better mental map. As conversational reframing, the mind-lines activate the Meta-Model strategy (see Chapter 10). From there, we can then redirect the person to new and better understandings that offer a more useful way to think. Other mind-lines enable us to align with the person’s intentions which then grants them permission to remap. Yet other mind-lines challenge and provoke a person by putting their own logic in their face to see if they can stand it when applied to themselves or applied consequently into their future. Because most of us become too easily entrenched and enmeshed in our maps, we seem to easily forget that our perspectives, beliefs, understandings, “drives,” etc. are just maps. We forget that and begin to think and feel that they are real. Yet our ideas and beliefs are only maps of reality, and not reality. When we forget, we confuse belief maps and territory. Korzybski described this process as identifying. We identify our maps (thoughts, beliefs, decisions, etc.) with reality. Yet there’s a difference between our maps about the territory, and the territory. And our maps are always inherently fallible and limited constructions. They are always defective and always liable to error. With Mind-Lines, we can now engage in some very elegant map-shifting with ourselves or others. As you practice them, notice if and when they shift you. Notice when and if they create a shift in another. Some will elicit pleasant shifts, some will evoke unpleasant shifts. As a neuro-semantic class of life, whenever our internal representations shift, so does our experience, our neurology, our identity, etc. This describes where “the magic” occurs. So get out your wand; and let the magic begin! Since we have all used various linguistic patterns throughout our lives to maintain our beliefs, this gives us a route for learning how to use these patterns. Namely, aim first to discover the patterns that you already use (or over-use). Once you identify your favorite patterns, notice the ones that you do not use at all, or very seldom. In the next chapter, you will get an overview of the reframing patterns. As you study them, notice the categories that you may find unfamiliar or new to how you typically shift perspective. Then give special attention to that pattern. Knowing and recognizing this power of language now empowers us to take charge of our own neuro-linguistics. Unsanity results when we use ill-formed structures to map out how to navigate through the territory of reality. A new use of language cures the bewitchment of limiting beliefs. In Mind-Lines we adapt the NLP re-languaging model (the Meta-Model) in order to reframe meanings conversationally. Born from the “Sleight of Mouth” Patterns, Mind-Lines sorts out the structure of meaning and believing. This enables us to more clearly understand and develop skills with reframing. And now the Mind-Lines Model for Neuro-Semantic Magic for fun and profit, for transformation and health. 6. Deframing: Tearing the Box Up From Beneath!